I think we all saw this coming. The Celtics were looking for revenge after losing to the Raps last Sunday afternoon, and the old guys prevailed last night. 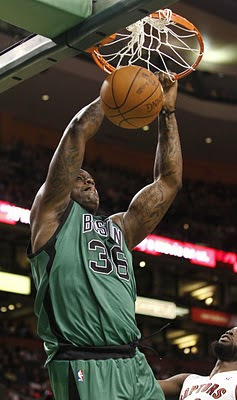 The Celtics also had a body back that they were missing from last Sunday's game too. Rajon Rondo. Rondo and the Celtics dominated immediately in the first quarter, building a 31-20 lead after one quarter. The Raps on the other hand, struggled to put out a consistent effort in the 9-point loss to the Celtics. It was an up and down game for the Raps, having cut down the lead in the second quarter but then the wheels fell off in the third quarter only to come back in the final 12 minutes. Sonny Weems and DeMar DeRozan struggled, as the Raps trailed by as much as 22 points in the third. Both Sonny and DeMar were 2-11 from the floor which signalled Triano to yank them out of the game in the third quarter. Jay went with an international lineup in the fourth quarter with Barbosa, Kleiza, Bargnani, Calderon and Stojakovic. And the group played well together. The international crew helped the Raptors make another run in the fourth to get within six. Calderon had an impressive showing scoring 12 points to go along with his 15 dimes, 5 rebounds and 4 steals. The Raps' second unit were the lone bright factor for the Raptors, scoring 63 of the Raps' 101 points. Johnson, Kleiza, Stojakovic and Barbosa all scored in doulbe figures. For the C's, the old guys did their thing. KG had 26 points (10-18) and 11 boards. Shaq chipped in with 16 points and 9 boards. Pierce finished with 18 points while Allen had 17 points. 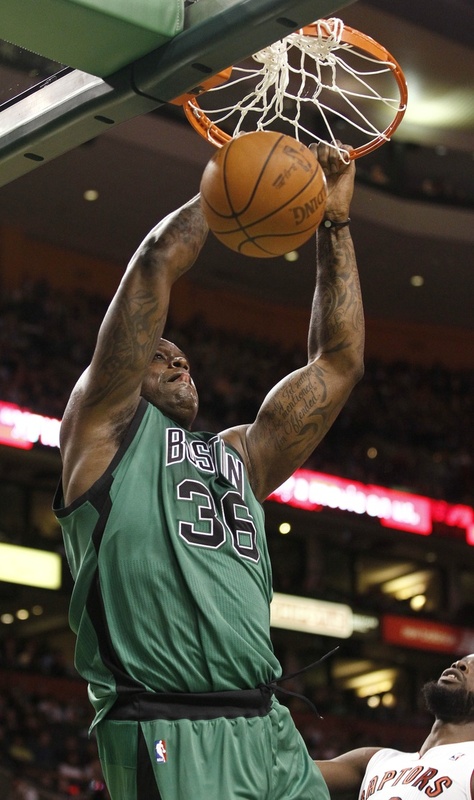 Glen "Big Baby" Davis was the spark off of the Celtics bench, scoring 10 of his 18 points in the final quarter to hold off the Raps. Bad news for Raps fans, after an impressive week for Reggie Evans, he left last night's game with a right foot fracture and looks to be out indefinitely. It looks like Amir will step into that starting role. The Celtics had 33 dimes which tied a season-high. 14 of those came from Rajon Rondo.